Growing up in Cloquet, Minn., population 12,050, the Zeadow sisters — Sammy '17, Carri '16, Bekka '14 and their sister Jen — enjoyed a happy, humble upbringing. Encouraged by parents who wanted bright possibilities for their kids, and buoyed by a community of friends and advisors, each Zeadow found her footing and embarked on paths to higher education. 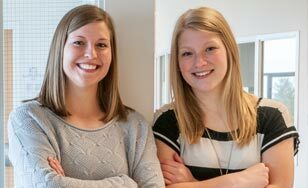 Carri and Sammy are both currently studying healthcare at St. Scholastica, while Bekka — who earned a double-major in biology and biochemistry from CSS — moved to a new school for graduate studies. Without initial contact with St. Scholastica Assistant Director and Program Coordinator Stephanie Sklors through the Upward Bound program, the three Zeadows may never have attended. Upward Bound is designed to provide motivation and tools to help need-based, first-generation college prospects complete high school, enter a post-secondary education program, and succeed in post-secondary education by earning a four-year degree. To accomplish this ambitious goal, students meet with CSS advisors and other students at various times during the academic year. "I was in Upward Bound from freshman through senior year of high school," Sammy said. "Every meeting with our advisor provided the time to ask questions and get to know more about college, along with keeping me on track with necessary grade requirements, application process, and other important aspects." Carri characterized her experience with Upward Bound as a time of gaining foundational knowledge and preparation for academic "next steps." "I was able to go on college tours, learn more about the ACT/SAT, and all the other logistics that go hand-in-hand with attending college," she said. "I probably would not be in the position I am now, graduating with a B.A. in Biology, without UB." At St. Scholastica, the Zeadow sisters have found support for their shared dream of helping and healing patients — Carri, who plans to enroll in the physician assistant program; and Sammy, as a nurse. "I have made many friends in the nursing program who can relate to my stress and accomplishments," Sammy said. "The nursing faculty are the most supportive, understanding and kind professors that I have experienced at CSS." Sammy said it's not just making people physically well that led to choosing nursing as a profession; it's the chance to address everything that ails a patient. "Taking care of the whole person — including emotional, physical, spiritual and mental health — is very worthwhile and rewarding," she said. "The nursing program is a great fit for me, because it combines medical care with the personal relationships formed through the care." While the prospect of stepping into a profession feels daunting, the Zeadows said their time at CSS has helped them to feel prepared for what's next. "I am most excited to care for, treat and transform my community into a healthier and happier place," Carri said. "Although I am nervous about what my future holds, I am excited to be able to share my knowledge and care for those in dire need."